Have questions? Consult an advisor. 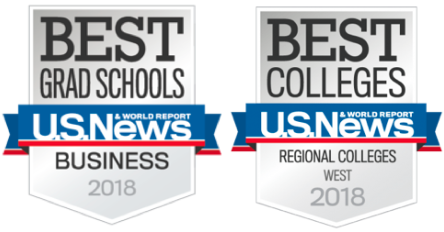 U.S. News and World Report ranked the College's Hybrid Non-MBA Graduate Business Programs #26 nationwide. The report also listed the Online MBA Program as fifth in California. The mission of the Master of Science in Accounting Program is to advance students' career opportunities in accounting in the public and private sectors. M.S. 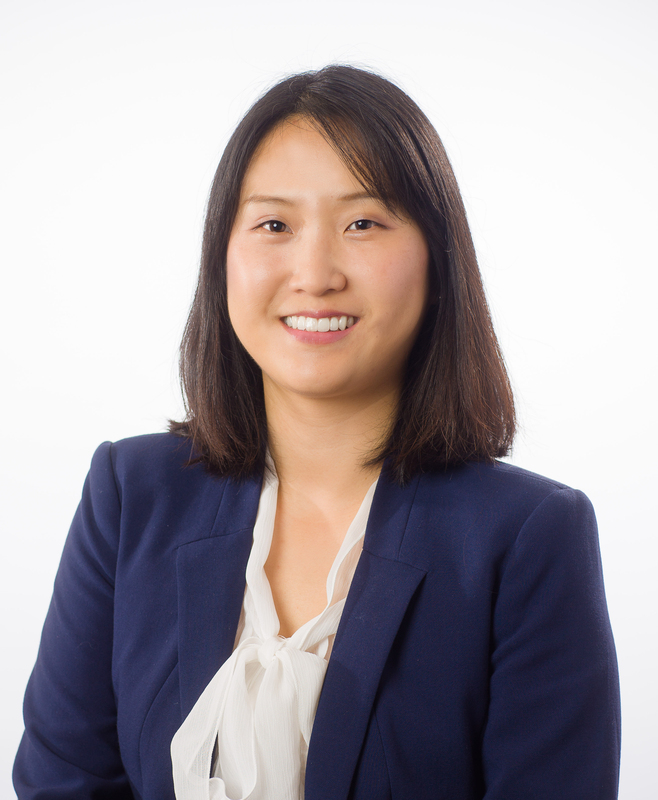 Accounting '16, Senior Corporate Accountant at Energy Recovery, Inc.
"I grew up in Korea, majoring in Business Management. After working at private companies for a few years as an accountant, I went back to school to advance my career. Being a full-time working professional with two little kids, Saint Mary's M.S. in Accounting program was a perfect fit. 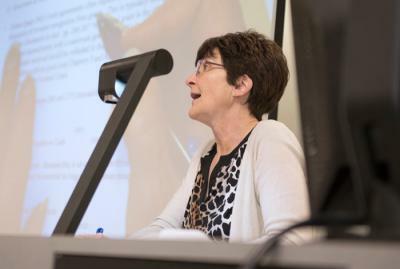 The hybrid format provided both online classes that are convenient and flexible and the on-site classes that provided personal interaction with our classmates and professors. Also, the SEBA Graduate Career Services prepared me well for the career fair so that I was able to secure a full-time offer at Armanino a year before my graduation date. 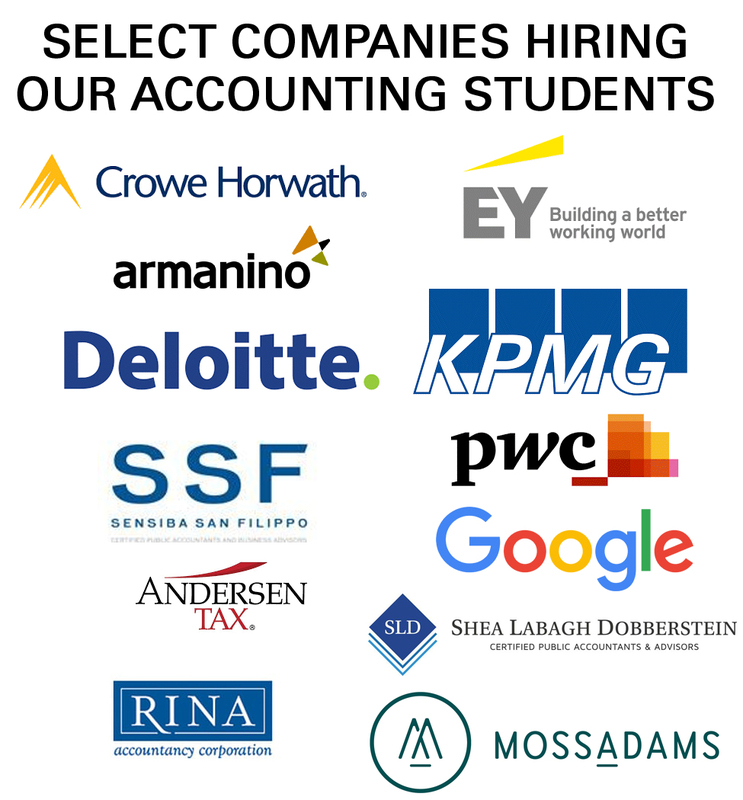 I highly recommend Saint Mary's for those who are looking to advance in the accounting field." The Saint Mary's M.S. 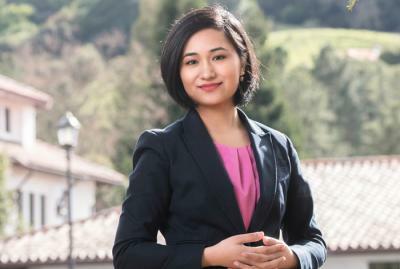 in Accounting degree helps prepare students for professional success in accounting in the public and private sectors while meeting the 150-hour educational requirement set by California law for CPA licensure. In this program you will learn the necessary skills to achieve this licensure. Core Courses: You will develop your ability to analyze accounting information, understand business functional areas, and be a responsible leader. You must meet the requirements for all eight courses. Applicants for admission to the M.S. in Accounting Program must hold a bachelor’s degree or its equivalent from an accredited college or university. Applicants with an undergraduate major or minor in accounting are not required to take the GMAT if their GPA is at least 2.8. If an applicant has an undergraduate major in accounting and the overall GPA is below 2.8, they must plan to begin the program in the Spring/April quarter. Applicants without an undergraduate major in accounting must plan to begin the program with Intermediate Accounting I/II in the Spring/April quarter. If an applicant without a major or minor in accounting has an overall GPA of 3.0 or better the GMAT is not required. The Spring quarter courses will cover introductory and intermediate topics in accounting and will include the preparation of four required financial statements and an in-depth analysis of various items on the income statement, statement of owner’s equity, balance sheet, and statement of cash flows. Classes will be delivered in the hybrid format - half of the class meetings online and half face-to-face in the classroom. Online classes will be held twice weekly in the evenings. Face-to-face sessions will be held every other Saturday on the Saint Mary’s Campus. Official GMAT or GRE Score (depending on GPA). GMAT Code for the Master of Science in Accounting is 3HX-9C-75. The GRE code is: 8798. The first part of this course provides a review of the accounting for business combinations. The rest of the course covers new material on accounting for multinationals and foreign currency transactions, segment reporting, corporate liquidation and reorganizations, and partnerships – formation, operations, changes in ownership interests and liquidation. This advanced course focuses on how managers generate and use accounting information within their organizations for planning and controlling operations, making short and long-term decisions, and evaluating and rewarding personnel. The content includes topics such as C-V-P analysis, budgeting, variance analysis, and differential cost analysis. 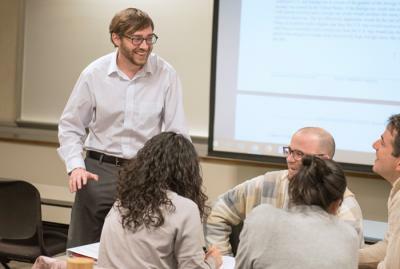 A variety of pedagogical techniques, including cases, projects, and student presentations are used to discuss real world managerial accounting issues. This course focuses on the accounting and financial reporting issues of governmental units, not-for-profit organizations, colleges and universities, and some health care entities. The course covers fund accounting and financial reporting for state and local units under GASB Statement No. 34 and not-for-profit accounting principles. This course examines the international dimensions of accounting, including topics such as international financial reporting and harmonization, International Financial Reporting Standards (IFRS), and international financial statement analysis. This course focuses on advanced topics related to the auditing standards promulgated in the U.S. for audits of public companies, private companies, governmental entities, not-for-profit entities and employee benefit plans. In addition, the course focuses on the standards promulgated by the International Auditing and Assurance Standards Board (IAASB) and the differences between these standards and U.S. auditing standards. It also focuses on the application of accounting and auditing skills to detect financial discrepancies and the presentation of fraud cases for criminal proceedings and litigation. This course examines the concepts and laws related to federal taxation of individuals, trusts, estates, and gifts. It is also designed to give students the tools and techniques to identify, understand and evaluate tax planning opportunities. Oral and written communication skills are emphasized. This course examines the legal implications of business transactions, particularly as they relate to accounting, auditing and financial reporting. In addition, students are required to apply the knowledge gained to evaluate the economic substance of client transactions, including purchase agreements, loans and promissory notes, sales contracts, leases and commitments. Oral and written communication skills and professional research skills are emphasized. This course examines the concepts and laws related to federal taxation of partnerships, C corporations, S corporations, and tax-exempt organizations. It is also designed to give students the tools and techniques to identify, understand and evaluate tax planning opportunities. Oral and written communication skills are emphasized. This capstone course is structured to integrate concepts learned in financial accounting, international accounting and various business courses. It is taught primarily using “real world” cases and financial statements. At the conclusion of the course, students will be proficient in valuing a firm using the information in financial statements and will appreciate the different uses of accounting information and their implications. This capstone course focuses on identifying, researching and appropriately resolving situations that might be unethical or a violation of professional standards. Oral and written communication skills and professional judgment are emphasized. "Boot camp with Dr. Sankaran is one of the best parts of the program. There's someone helping you but not babying you. The M.S. 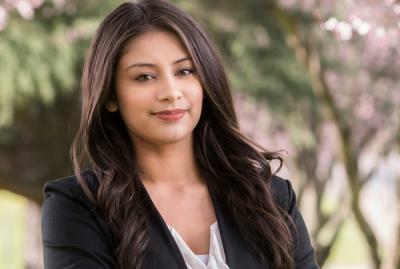 in Accounting program at Saint Mary's is worth every penny; it's definitely worth it." 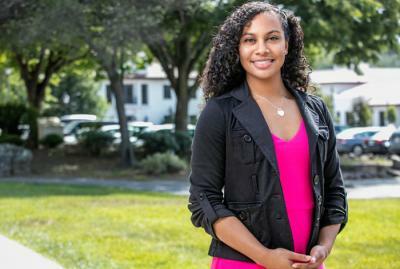 "Obtaining my Masters in Accounting has been fun and challenging at the same time. I'm learning so much. I feel like I made the best decision to join Saint Mary's College. The College has given me a great backbone to achieve things I wouldn't even have thought of a year back, if I had not joined. I would have never thought I would get into Deloitte. Joining Saint Mary's is what gave me that opportunity and platform. I'm happy that I made the best decision for myself." Featured Class: "Governmental and Not-for-Profit Accounting"
Chambers, Dennis, James Dooley and Catherine Finger. January 2015. Preparing for the Looming Changes in Lease Accounting: A Technological Solution for the Informational Problem. The CPA Journal, 38-42. Finger, Catherine. April 2015. Resource Review: iOS Application Attendance2. Journal of Management Education, 304-309. Featured Class: "Federal Income Taxation of Business Entities and Ethical Issues"
Kevin McGarry is a licensed attorney in Florida, the U.S. Court of International Trade in New York City, and the U.S. Tax Court in Washington, D.C. Kevin holds an M.S.I.A., M.B.A., J.D. and a Taxation LL.M. from the Graduate Tax Program at the University of Florida. His research interests encompass relationships between tax, trade, sustainability and human rights. Prior to Saint Mary's College, he taught at Texas Wesleyan University in Fort Worth. Spring M.S. Accounting Classes begin April 1. Final deadline to apply is March 1 to start this spring!